Our Warm Line is a peer-run service for residents of Virginia. We offer this support line for individuals, family members, and other concerned parties who would like someone to talk to, or who request community mental health resources, or who have specific questions about their recovery journey. The peers who answer our Warm Line listen with compassion and provide non-judgmental support. MHAV Warm Line peers work hard to give individualized care and attention to each caller. Peers provide personal examples of wellness, recovery and hope, and maintain personal wellness as a model to communities and callers alike. The peers at MHAV are not licensed professionals, medical providers, or legal advisers. MHAV’s Warm Line is not intended for these purposes. Additionally, the staff and volunteers at MHAV maintain strict confidentiality and do not divulge personally identifying information regarding a caller. When times are busy, the Warm Line call may be limited to 30 to 45 minutes as we have others to serve as well, but not to worry! In that phone call, we'll ensure that you're receiving undivided attention -- straight from people who have lived experience with mental health and mental health recovery. Plus, you can always call back if you're just having of those days that seems almost unbearable at times. A Warm Line is not a Hotline, which is for individuals in need of emergency services. If you are in crisis, please call the National Crisis Hotlines 1-800-273-8255, or 911. 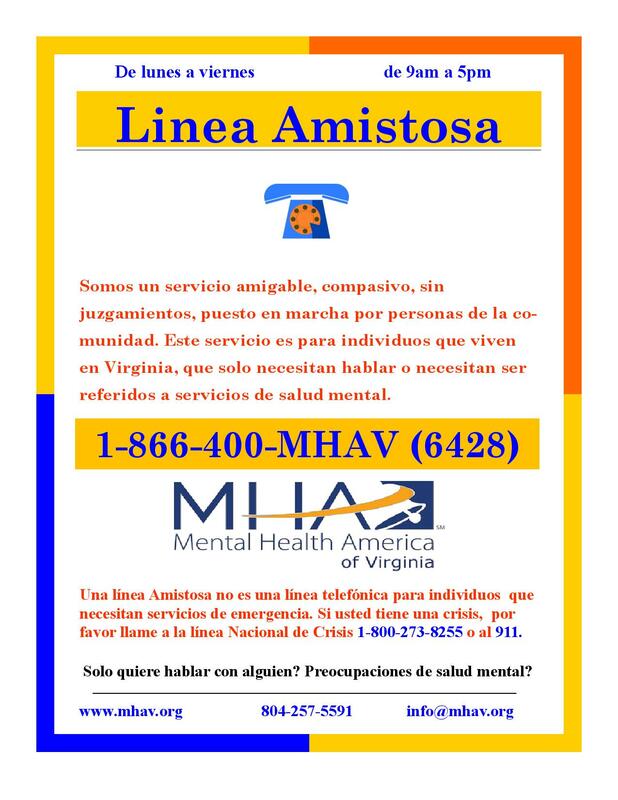 Mental Health America also has a partnership with Crisis Text Line; text MHA to 741741 if you'd like to use the Crisis Text Line if you feel like you're in crisis. Our Warm Line can be used to provide peer support -- to help you identify coping strategies, local area resources and support groups, allow you to vent (without bias), etc. to support your overall, and specifically, your mental health well-being. If you need support in calling the crisis hotline(s), we can always conference call with you in order to provide you with support as we know how emotional these situations can be.